Cut drying time in half! Great for heavy-coated breeds. More blowing power than comparable dryers! Choice of one motor for delicate jobs or two motors for more power. Portable and Lightweight. Two speeds, 118 CFM, 34,321 - 62,000 FPM, 18.5amps and 18 gauge steel body. 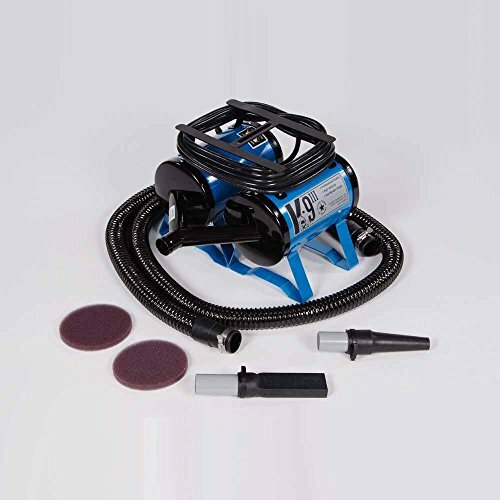 Includes 10-foot hose, two different blower tips and two filters. If you have any questions about this product by K-9 Dryers, contact us by completing and submitting the form below. If you are looking for a specif part number, please include it with your message.